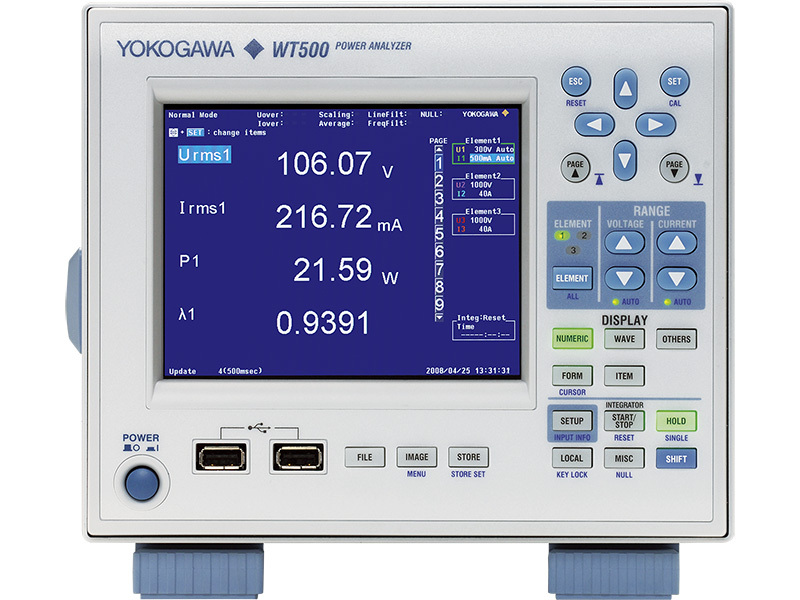 The WT500 Power Analyzer excels at single- and three-phase power measurements. Standard features include a color TFT display and USB interface for communications and memory. The instrument has a basic power accuracy of 0.1%, maximum inputs of 1000 V, 40 A and a measurement bandwidth of DC to 100 kHz. Cursor keys can be used to move the on-screen cursor in four different directions. The cursor keys and SET key can also be used for making selections in soft menus. The WT500's menu structure is even more user-friendly than other models. 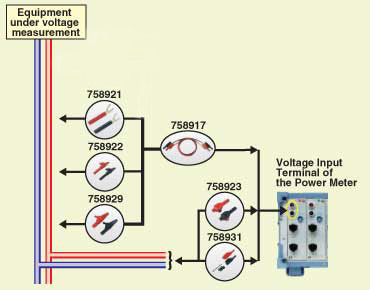 The RANGE keys can be used to set the voltage and current ranges. Quick intuitive range control is available by using direct keys. DISPLAY keys can be used to switch between numerical values, waveforms, and other displays. The display format can easily be changed. 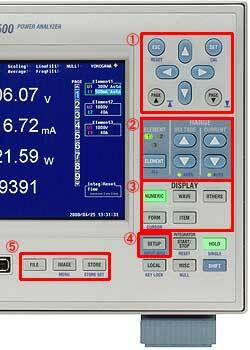 The SETUP key can be used to enter various settings required for power measurement such as the wiring method and filters. The keys related to data storage are located in the same area. Data can be easily stored to USB memory. Evaluation of DC/AC signal conversion technology is critical in the renewable energy market. With input from 2 or more elements, the WT500 can measure DC and AC signals simultaneously and calculate input-to-output efficiency. The WT500 is equipped with integration functions that can not only evaluate charge and discharge current such as from secondary cells, but also bought and sold power in photovoltaic power generation systems. 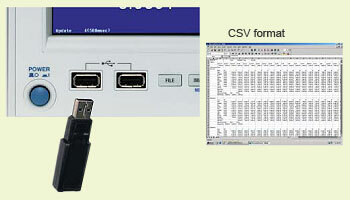 Measured data can be saved in CSV format directly to USB memory. Menu-type screen offers intuitive setting. 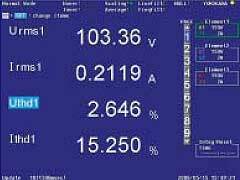 RMS voltage, RMS current, power values, and harmonic components up to the 50 order can be measured simultaneously. The WT series have been used as powermeters for Green IT, Energy Star, CO2 reduction and other energy-saving equipment. The WT series-Including the WT500--supports your power evaluation needs. Intuitive control by using cursor keys in four different directions. To reduce setting errors, menus display settings in order of relative importance in order. Two USB ports for peripherals are installed for direct data saving (up to 1 G byte) in USB memory at shortest intervals. The saved data can be opened in applications such as Excel. * Excel is a registered trademark of Microsoft Corporation in the U.S.A. In addition to numerical data, the WT500 can display input signal waveforms and trends (time variation of numerical data). 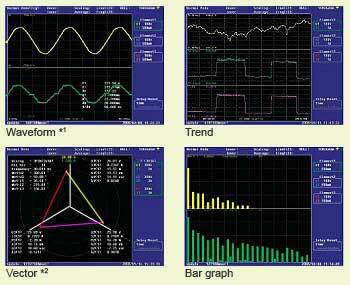 Bar graph display and vector display are also available with the harmonic measurement (/G5) option. *1 Waveforms of up to approximately 5 kHz can be displayed. Split screen display for numerical values and waveforms is not available. Only necessary items within the measured data like voltage, current, and power can be saved in USB memory in binary or CSV format (up to 1 GB). Files saved in CSV format can be opened in general-purpose applications such as Excel to allow displaying of data in graphs. In addition to integration functions of active power (WP), current (q), reactive power (WQ), and apparent power (WS), a new feature provides measurement of bought and sold watt hours. Also, average active power can be calculated over an integration interval. This feature is useful for evaluating the power consumed by intermittent-control instruments in which the power value fluctuates. 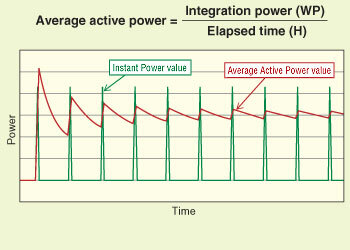 Average active power is calculated by using user-defined settings. GP-IB communication enables you to control the WT500 or transfer data from a PC. Data can be transferred via Ethernet* communication. It enables file transfers using an FTP server. 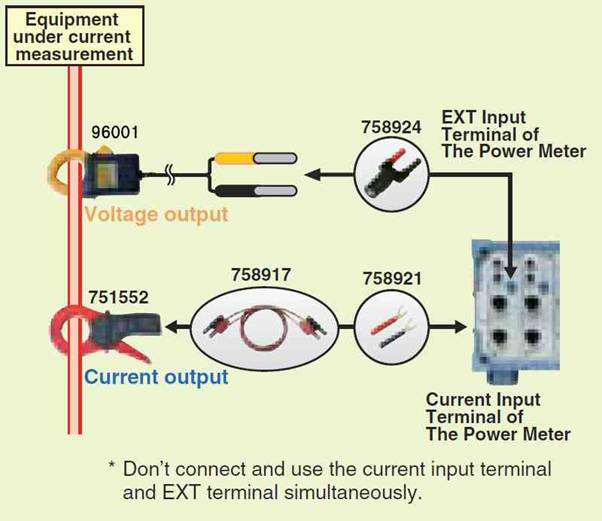 Current can be measured by using current clamps without disconnecting power supply wiring (voltage output type). By setting an external current sensor conversion ratio, it can support various types of current clamp-on probes. 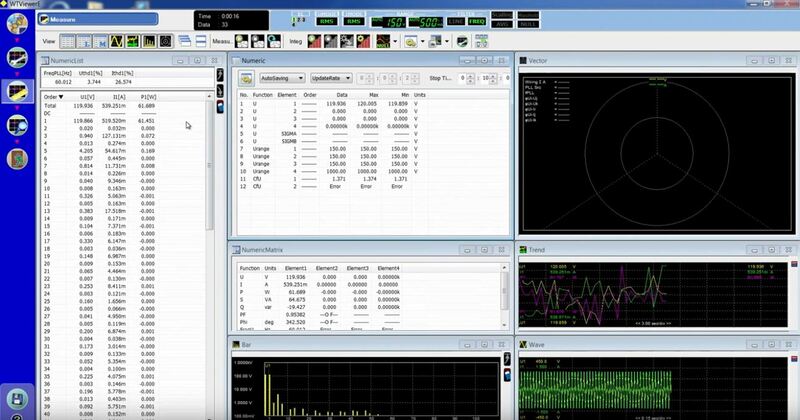 By connecting to a monitor, you can create large displays of numerical values and waveforms. This function is convenient for simultaneously confirming data on multiple monitors, or to check data remotely. This function enables simultaneous measurement of normal and harmonic data. Harmonic components of up to the 50th order can be measured. With the WT500 you can simultaneously confirm voltage, current, and the distortion factor (THD) as well as measure the distortion factor without switching modes. This function allows you to calculate individual phase voltages and phase currents from the line voltages and phase currents measured in a three-phase, three-wire (3P3W) system. The phase voltage can be calculated from the line voltage measured with the three-phase, three-wire (3V3A) method. This is useful when you want to determine the phase voltage in a DUT with no neutral line by using the three-phase, three-wire (3V3A) method. Note: This function cannot be installed on products with only one element. 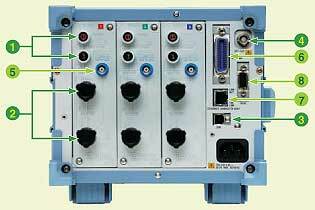 In addition to the standard two channels of frequency measurement, an option is available for frequency measurement on all channels. 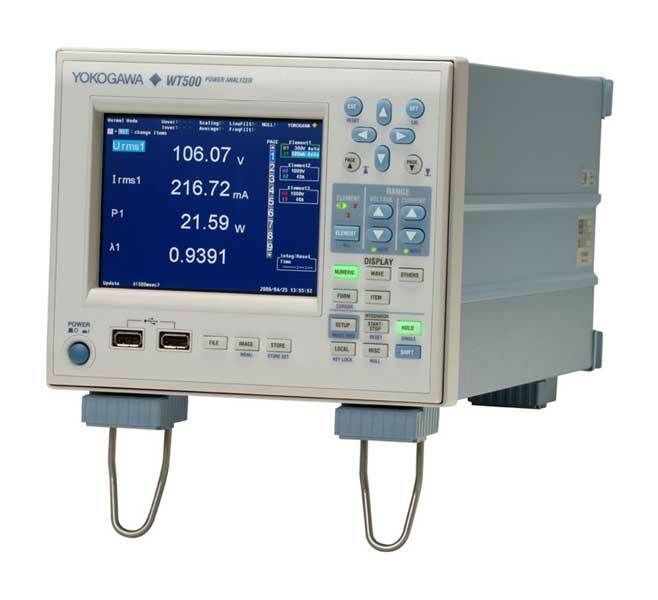 This option provides frequency measurement of voltage and current on all channels with input elements 1 through 3 installed.This is necessary when you want to measure voltage and current frequency from the instrument's I/O as well as voltage and current frequencies of multiple items under test at the same time. Note: This function cannot be installed on products with only one input element. *Don't connect and use the current input terminal and EXT terminal simultaneously. Photovoltaic power generation has gained attention in recent years, largely due to a new sense of urgency regarding the prevention of global warming. To evaluate AC adaptors, engineers must acquire the voltage. In recent years the buzzword "all electric" is becoming popular, which refers to kitchen appliances, water heaters, and other devices in the home all being supplied with electric power. These days people are talking about the problem of energy depletion, and the industry is turning more and more toward stricter energy savings policies and the use of renewable energy.